When it comes to change, I am an old soul, or as my husband likes to say “set in my ways.” Well the joke’s on him for I have known this since I was 3, just ask my siblings. I’m a total Type A personality. I hate change and it takes me a while to get on board with new technology. You would think someone with a spinal cord injury would appreciate modern innovations. It wasn’t until my recent hospitalization with sepsis that got me on board with the Smart Watch trend. I had been seeing Apple watches everywhere, specifically in medical offices. I started asking people how they were using their iWatches, just to sate curiosity. The feedback was astounding. It seemed that everyone agreed, they were worth every penny, despite their high cost. Eventually I bought one and it has become part of my daily life. I use it just as much, if not more, than my wheelchair – that’s no exaggeration. I even had it listed as a medical device in my home care plan with Disability Action Center. The Apple watch goes beyond the obvious functions of a watch. I originally wanted it because of the specialized wheelchair workout feature. 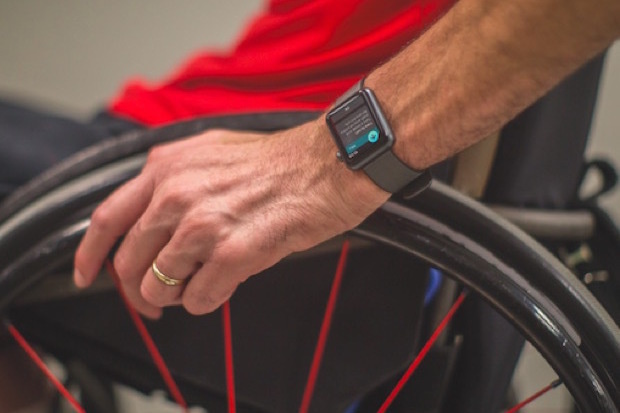 It’s the only one on the market that will accurately count the number of pushes a wheelchair user makes. Trust me, I have had every pedometer on the market. It was very discouraging when I would go to the gym or physical therapy and see everyone with their Fitbits. My Apple watch allows me to join in with these able-bodied activities, without having to feel out of place or ask for reasonable accommodations. For the first time in 7 years, I feel like myself again. I don’t feel like just a wheelchair mom or a wife who is paralyzed. I am finally getting back to my daily life again, and it feels great! Here are some other ways that my Apple watch has given me some independence back. I love that I don’t need my phone open anymore to receive notifications or take a call. As a wheelchair user, I usually have my phone in a bag of some sort on the back of my wheelchair. Not really accessible but it’s pretty much my only option. Unless you tuck it between your legs; which results in it falling on the ground when you hit a bump! The app will give a bell like sound with a slight vibration to let me know that I have an alert. I never miss a phone call, text message, email or appointment. I can also see the weather as it changes every hour. I can choose to accept, ignore or snooze the notification. No longer do I spend an awkward 5 minutes trying to find my phone buzzing in my bag. As a parent, I live for lists, alarms, timers and reminders. I literally couldn’t function without them. My child would probably fall asleep in the bathtub while I burn the brownies in the oven if it weren’t for these apps. Seriously, it may or may not have already happened before – I plead the 5th! On the paraplegic side of things, I have what is called neurogenic bowel and bladder. This means I have to schedule my “potty” times and when to take my medications. I use alarms that are set for every 3 hours to empty my bladder. I use reminders for medications, bowel care, shower times, and anything else I need done. A cool feature on the reminder apps is that you can schedule for time, location, and/or to reoccur on certain dates or times. I know, right? Amazing! Oh, and don’t forget Siri. She is a personal assistant. You just say “Hey, Siri” and she will do whatever you need. She can tell you the weather, book appointments, look things up, call a friend, and even tell you a joke if you need it. Some other apps to keep you sane and worth mentioning are Pandora, Maps, Flashlight, and Ping. If you have a smart phone I probably don’t need to tell you how amazing these are but I honestly find myself using Ping and flashlight more than I should. Ping is a feature that will sound your phone when you have misplaced it. The flashlight is great because trying to old a flashlight with one hand and push a wheelchair only leads to my face in a wall. Maps will give me a wrist vibration when to make a turn as well as announce it on the watch. period. Blue is the notifications to stand or roll. While you are wearing your watch, it also acts as a heart monitor. You can adjust it to alert you when you go under or over a certain heart rate. And the watch will alert you through an app called Breathe to stop what you are doing for a minute to catch your breath. It will count your breaths with you by vibration. You can also be specific with timed workouts, including swimming. Yes! It’s waterproof! It has a SOS feature that gives you a sense of security. If I need medical attention, one push on my watch and I am immediately connected to 911. Which means I can shower with it if need be. Sometimes I don’t always need help showering, but it’s nice to know I basically have a “modern” life alert button wherever I go. There is a medical ID badge that can store all of my information such as: name, emergency contact, blood type, medications, medical conditions and allergies. It won’t replace your iPhone and you need to stay within your phones Bluetooth distance. And you can’t use social media on it, for good reasons. You will need to use your phone to get your daily dose of memes and cat videos! If you need help setting up your watch, connect with DAC NW and we can help!